Mankato Brewery is excited to announce its first collaboration beer with Lupulin Brewing Company in Big Lake, Minnesota. It’s fitting that a hazy, juicy and fruity India Pale Ale (IPA) be brewed with Lupulin Brewing; however, this collaboration beer was created to bring attention to Men’s Health and Cancer Awareness during the month of November. Hero Hazy IPA is all about friendship, awareness and never surrendering to the fight against cancer. So, become aware, get tested, and live longer. 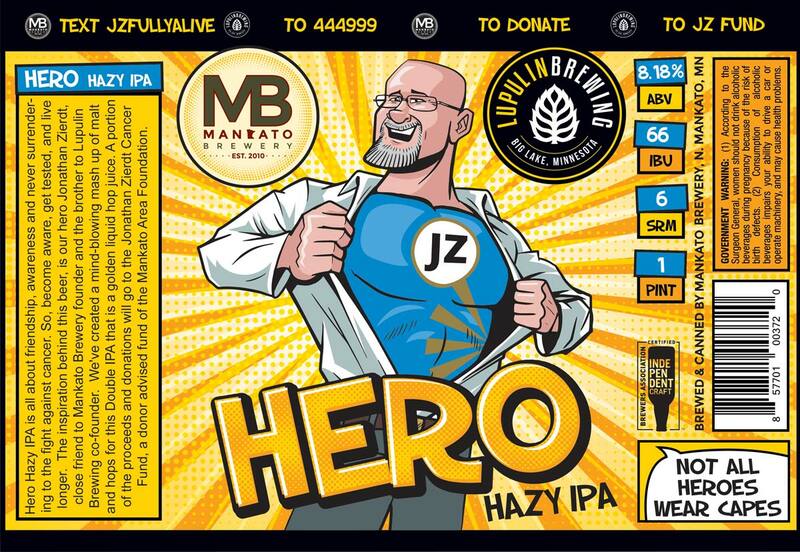 The inspiration behind this beer, is our hero Jonathan Zierdt, close friend to Mankato Brewery founder, Tim Tupy, and the brother to Lupulin Brewing co-founder, Jeff Zierdt. We’ve created a mind-blowing mash up of malt and hops for this Double IPA that is a golden liquid hop juice. This Double IPA comes in at 8.18% ABV and 66 IBU’s and is significant as this is Jonathan’s date of birth (8/18/66). The beer will be officially released at the growMANkato Shavedown at Mankato Brewery on Thursday, November 1st starting at 6 pm. Following this event, expect to see 4 pack – 16 ounce cans throughout local, metro and regional liquor stores while at the same time on draft in the Mankato Taproom and local establishments. A portion of the proceeds and donations will go to the Jonathan Zierdt Cancer Fund, a donor advised fund of the Mankato Area Foundation. Jonathan Zierdt is the President & CEO of Greater Mankato Growth, Inc. Jonathan has been battling cancer for five years and has been using his illness to bring awareness to men’s health issues and his foundation. The Jonathan Zierdt Cancer Fund works to increase community cancer awareness and support and to help change the cancer journey for those in our region who receive a cancer diagnosis. The rim text of the 16 ounce cans will contain all the information needed for texting donations to support the Jonathan Zierdt Cancer Fund’s current fundraising effort – the Box Love campaign.